The title of this disc is its programme, as the liner-notes explain. It is taken from a book of St. Augustine: "The whole life of a good Christian is sacred desire" (sanctum desiderium). That sacred desire refers to the character of the pieces selected for this disc. It opens with a cantata by Dieterich Buxtehude, Quemadmodum desiderat cervus. The text is put together from the first verses of Psalm 42 and free poetry from a Latin prayer book by a Lutheran theologian of the 16th century. The opening lines set the tone: "As the hart desires the water spring so longs my soul for you, God". This piece, scored for tenor, two violins and basso continuo, is based on a chaconne, one of the most popular bassi ostinati types of the baroque era. The incessant repeat of the same bass pattern creates a strong sense of intensity and urgency and fits the tenor of the text. Buxtehude was one of the last and the greatest representatives of the North German organ school, which was partly influenced by the stylus phantasticus which had emerged in Italy shortly after 1600. Many German composers enthusiastically embraced the Italian style, which they merged with their own contrapuntal tradition. That also comes to the fore in the oeuvre of Buxtehude's contemporary Johann Philipp Förtsch, who was one of the founders of the first public opera house in Hamburg, which opened its doors in 1678. Here he sang as a tenor and he also composed a number of operas, which are all lost. In 1680 Duke Christian Albrecht of Holstein-Gottorf appointed him Kapellmeister as successor to the highly reputed Johann Theile. Only three years later, Duke Christian had to flee to Hamburg. That was the end of Förtsch's activities in Gottorf and also in the field of music. In his early years he had studied medicine and in 1683 he settled in Husum as a doctor. The 80 extant sacred cantatas from his pen all date from his three years in Gottorf. They bear witness to his dramatic talent, especially those which have the form of a dialogue. Aus der Tieffen is a setting of Psalm 130 which is another text expressing strong desire: "Out of the depths I cry to you, Lord, Lord, hear my voice". It is a bit unfortunate that this piece was chosen as it has been recorded at least five times before. In all those recordings the solo part is performed by a soprano, so we may assume that this is the original scoring. However, in most cases it is fully legitimate to perform such a part an octave lower. Förtsch was born in Wertheim in Franken and probably received his musical education from Johann Philipp Krieger in Bayreuth, although there is no firm documentary evidence for this. Krieger is a key figure in the development of the church cantata in Germany. He was from Nuremberg and after studies with Caspar Förster in Copenhagen he entered the service of Margrave Christian Ernst of Bayreuth. When the latter became involved in the war against France, Krieger was allowed to travel to Italy, where he studied with Johann Rosenmüller in Venice and Bernardo Pasquini in Rome. In 1677 he was appointed organist in Halle at the court of Duke August of Saxony-Weissenfels. When the latter died in 1680, Krieger was appointed Hofkapellmeister by his successor, Johann Adolph I. The new Duke rated music even more highly than his predecessor, and that was reflected by a new order of worship which was introduced in 1684. This explains the large production of sacred works by Krieger. In his oeuvre we find compositions in the style of the sacred concerto of the 17th century but also the first examples of the sacred cantata in Italian style which point in the direction of Bach's cantatas. The two pieces selected here are something in between: they have the texture of the sacred concerto as they are both through-composed. However, there is also some distinction between recitative and more arioso-like episodes. Herr, auf dich traue ich is a setting of Psalm 31 which has the character of a prayer: "In you, Lord, I have taken refuge, let me never be put to shame", "Turn your ear to me", "Be merciful to me". Psalm 23 is one of the best-known from the Book of Psalms. Der Herr ist mein Hirt has not the character of a prayer but in its mood it is close to the text of Buxtehude's cantata. The remaining pieces are instrumental works by two composers who were strongly influenced by the Italian style. Johann Caspar Kerll was organist at the imperial court in Vienna; he had studied with Giovanni Valentini, imperial Hofkapellmeister in Vienna, and with Carissimi in Rome. He composed a number of operas which have been lost, some masses and organ works; the latter are the best-known part of his output. Only a handful of instrumental works have come down to us; unfortunately the track-list doesn't specify which sonata is played here. It is a perfect example of a piece in Italian style which is mixed with the German contrapuntal tradition. With the last piece in the programme we come full circle, so to speak. Like Buxtehude's cantata, Johann Heinrich Schmelzer's sonata La bella pastora - in other recordings called La bella pastorella - is based on a basso ostinato. It comprises 11 variations in increasingly virtuosic style over this bass line. In the liner-notes we read that this piece is about "a whole different kind of desire than the holy longing of Augustine, but also remind of the image of God as the shepherd in Psalm 23". While acknowledging that there is no watershed between the sacred and the secular at that time, this seems a little too far-fetched, especially as it is impossible to know exactly what Schmelzer had in mind and what may have inspired him. Let's take this piece just as what it is: another beautiful example of Schmelzer's brilliance and a specimen of the happy mixture of Italian and German elements which is one of the features of this programme. 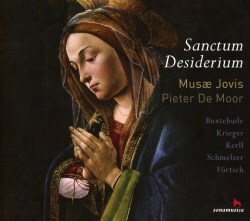 The ensemble Musae Jovis was founded by Pieter De Moor in 2015 and this disc is likely its first. It is a very good one, which I have enjoyed a lot. The music is attractive and the programme has been put together intelligently. The performers have grasped the style of this repertoire rather well. The instrumentalists are excellent and play with much imagination. I like Pieter De Moor's voice and his style of singing. His German is pretty good, although not completely idiomatic. Unfortunately a slip of the tongue in Krieger's Auf dich, Herr, traue ich was not corrected: about halfway De Moor sings "schauen" instead of "scheuen", and as a result the sentence doesn't make sense. I also would have liked a more declamatory approach: sometimes there is too much legato and now and then stronger dynamic accents would not have been amiss. The recording is good but the voice is a bit too strongly in the left channel. That was especially unpleasant in the first item. I probably got used to it, but it is not as it should be.